Facebook has quietly rolled out a very small — but important — feature that could make a very big difference for brands: The ability to add a call-to-action button to ads and posts. You’ve likely started to notice posts from brands in your News Feed that have a button placed under the link title and within the description. This isn’t only for ads. It’s for organic posts, too. And it’s not even a test feature that’s only available to the biggest of brands. You very likely have access to call-to-action buttons and can benefit from them, too! First, the obvious: A native call-to-action button is bound to be good for click-through rates. We know from testing that users are more likely to act when they are prompted to do so. As a result, marketers make sure that their copy includes a call-to-action. And some will also attempt to include a button within the image thumbnail. This can only help get more clicks. Second, this helps marketers since it takes the pressure off of putting these CTAs within the thumbnail images. As we know, Facebook has a very frustrating 20% text rule within images. Every character is important. Now marketers can focus on a compelling message within the thumbnail image, but save the call-to-action for Facebook’s button. Currently, the only way to create call-to-action buttons is within Power Editor. You can’t do it within your Page, and you can’t do it within the self-serve ad tool. Note that for now the only content type that can include these buttons is a link share. So it needs to utilize the “Clicks to Website” objective, but only while creating an Unpublished Post (though there is an exception: if you create an organic post as described in the next step!). Within the default “Link” view, fill out the link you want to share and promote the way you normally would. The only items that are required are the URL and post text (the commentary you add with the link). 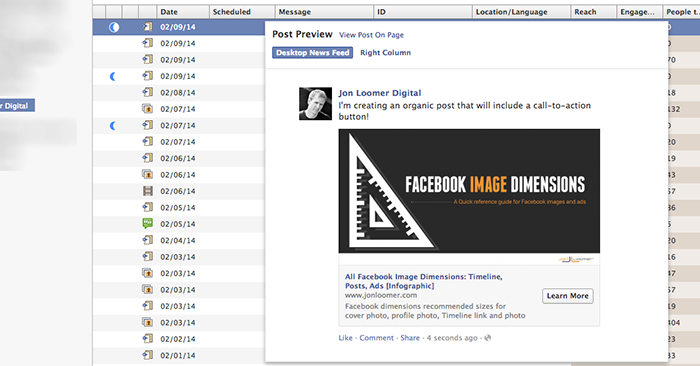 Facebook will automatically pull the link thumbnail, title and description (though you can override these). Note the new option for a call-to-action. By default, there is “No Button.” But you can create a button with one of five calls-to-action! Something to keep in mind here is that your call-to-action button will only appear on ads within the News Feed, not the sidebar. Initially when I heard about this, it seemed like an incomplete feature. Sure, it’s great to have it for ads. But if you promote posts, you’ll need to create a completely new, unpublished post to add the button. And it sure would be nice to include a button for organic posts, too! Well, guess what? You can do it! But once again, you need to use Power Editor. 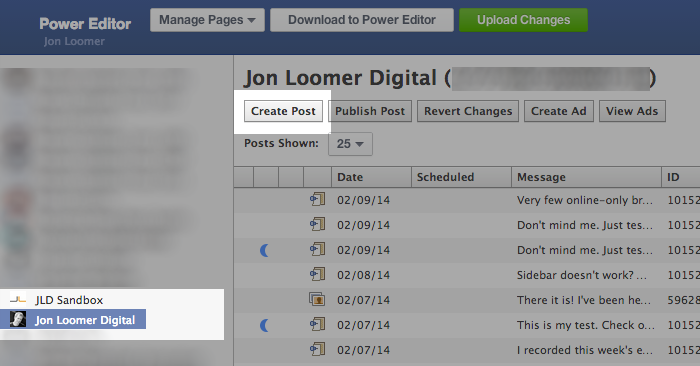 Most marketers don’t realize that you can actually create posts from Power Editor. Honestly, there was very little reason to do this until now. But this little addition changes everything. 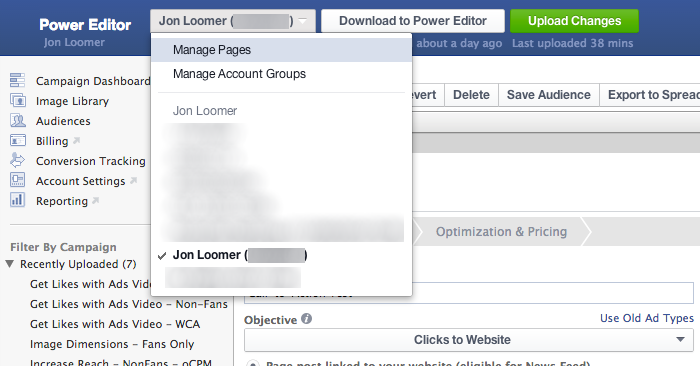 First, you’ll want to select the “Manage Pages” option from the top left drop-down within Power Editor. 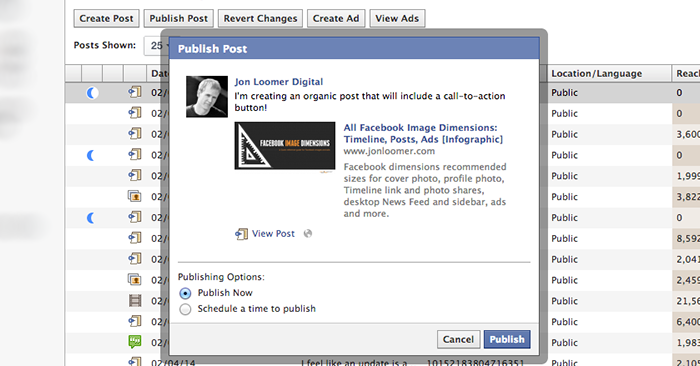 Next, make sure that the page you want to create a post from is selected on the left. Then click the “Create Post” button. That will bring up a dialog that looks identical to what you saw when you were creating an unpublished post. 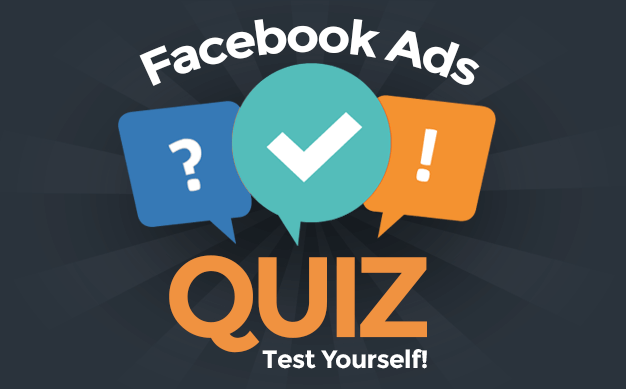 The reality is that you’re doing the exact same thing, but without needing to create an ad. Click the “Create Post” button when you’re done. Highlight the row that includes that new unpublished post to preview it. The only step remaining is to click the “Upload Changes” button to push your post live, complete with a call-to-action button! Personally, I am going to make sure that any time I share a link to my website, I include a call-to-action button going forward. It just makes sense! Since there are five different CTA options, I’d also recommend split testing different buttons where it makes sense. For example, if you are driving traffic to a sales page, you may try the “hard sell” buttons (Shop Now, Sign Up, Book Now) or the soft sell (Learn More). 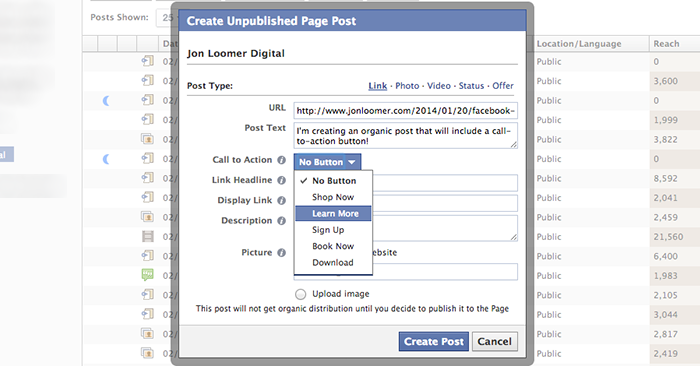 How will you use call-to-action buttons on your Facebook content? Let me know in the comments below!